Patients tend to prefer the treatment because it helps allay symptoms such as general pain, muscle spasms, limited joint movement, weak muscles, bad circulation, instability, and paralysis. Most of the general principles of land-based exercise are also recommended for water-based exercise, such as including a warm-up and cool-down and allowing adequate rest between sessions (e.g., one day). Most importantly, exercise should be focused towards achieving client-directed goals that are meaningful and relevant to the individual. The types of exercise commonly used in water include strength, fitness, balance, stretch and relaxation exercises. Many people with MS enjoy stretching and relaxation exercises such as passive range of movement exercise or massage. These exercises can be part of anyone’s aquatic exercise program but are found to be particularly enjoyable by people who are less mobile because they are able to move the muscles and joints beyond what they can achieve on land. The person floating in the supine position has an assistant behind their head, who gently holds them at the trunk sides, and slowly guides their body through an arcing motion (from side-to-side). The supine body sway exercise allows the trunk and hips to stretch at the end of each movement. Stretching may be difficult for people who experience strong spasms or spasticity. It is important for the assistant to position the person so that they avoid excessive strain on their own body, for example when passively moving the hips into abduction with the person in the supine position. Rather than having the assistant stand at the feet and separate the legs with one hand on each ankle, it may be better for them to stand between the person’s legs at the distal end. The assistant can then rest their own back against one leg to stabilise it, and use both their hands to push and separate the other leg. This is usually more comfortable for both the assistant and the person undertaking the stretching exercise. People who have spasticity and some active muscle control may benefit from stretching techniques that alternate resisted contraction of the spastic muscle with stretching of the spastic muscle. For example, for a person with excessive knee extensor tone, alternate isometric resisted active knee extensor contraction, with passive knee extensor stretch. Repeated contraction and stretch may lead to increased relaxation of the knee extensor muscle, which may improve the person’s comfort and ability to participate in other exercises during the aquatic exercise session. Strength training involves working against the resistance of the water, body, or floatation devices. Slow leg kicks or arm movements through the full range in flexion, extension, abduction and adduction, as well as squats, calf raises and jumping. Increase resistance by using aquatic dumbbells, hand paddles, aquatic ankle weights or by moving through the water at a faster rate. Decrease resistance by slowing movements, eliminating body weight (by supporting the body with floatation devices such as pool noodles, floatation mats or buoyancy vests, or by exercising in deeper water) or performing movements close to the surface of the water. Increase repetitions and amplitude of movements (e.g., jump higher or further). People who are unable to maintain a standing position independently (e.g., due to weakness or balance impairment) may be able to do so by holding onto a rail at the edge of the pool or with the assistance of a floatation device such as a pool noodle, buoyancy vest or buoyancy ring. Alternatively, many exercises can be performed in supine instead of standing. people can be safely supported in supine by using a combination of floatation devices, such as a neck float to maintain the head above water, a trunk float such as a buoyancy vest or ring, and lower limb floats such as pool noodles or ankle floats. The choice of floatation device is usually guided by the person’s size and comfort level in addition to the need to allow movements suitable for the desired exercise. Some people may have difficulty maintaining balance during resistance exercises due to the turbulence created by their movements. 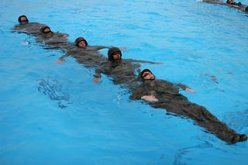 They may be able to stabilise the body more effectively by leaning against the pool wall during upper limb exercises, holding a rail during lower limb exercises or by exercising in shallower water. Increase intensity by adding resistance such as hand paddles during swimming or flippers during kicking, increasing speed of movement or increasing duration of activity. Decrease intensity by minimising resistance, slowing movements, reducing activity duration or reducing body weight (e.g., exercising in deeper water). People who have difficulty swimming (e.g., due to impaired coordination or weakness in upper or lower limbs) may be able to participate by focusing on the upper limbs separately to the lower limbs. For example, the legs may be supported with ankle floats, a pool noodle or other buoyancy device when working the arms. Then the arms and trunk may be supported by a pool noodle or buoyancy ring when working the legs. A neck float may also assist people who have difficulty with swimming to feel more water confident. People who have difficulty maintaining balance during walking, running or jumping activities may benefit from holding on to a pool edge rail or a floatation device such as a pool noodle or aquatic dumbbells. Cycling and kicking exercises can be performed in supine or prone positions (using floatation devices) to maximise comfort and safety. 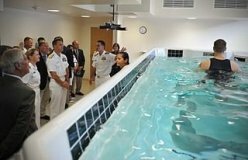 Balance training involves Hydrotherapy Exercises For Neuro Rehabilitation that reduce the base of support (e.g., standing with one foot directly behind the other or standing on one leg) and/or which perturb the body (e.g., balancing when performing arm or leg movements against the resistance of water). 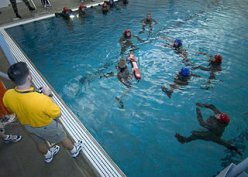 Increasing water turbulence (e.g., combine balance exercises with arm or leg movements that perturb the water, or perform balance exercises in choppy water). Decrease difficulty by increasing buoyancy (e.g., exercise in deeper water), increasing base-of support (e.g., reaching with feet wide apart),reducing movement complexity (e.g., avoiding combined arm and leg exercises such as start jumps), minimising water turbulence and providing minor balance assistance (e.g., exercise within reach of a rail or walking with pool noodle in front of the body). People who are non-ambulant on land may be able to balance and walk in water if they are supported with floatation devices such as a buoyancy vest, buoyancy ring or a pool noodle. People who are fearful of being unable to stand up after slipping in the pool may feel more confident if they have a neck float which will keep their head above water at all times. Mehrholz J, Kugler J, Pohl M. Water-based exercises for improving activities of daily living after stroke. Cochrane Database Syst Rev. 2011 Jan 19;(1):CD008186. doi: 10.1002/14651858.CD008186.pub2.